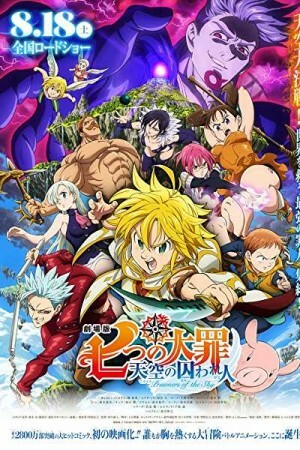 The Seven Deadly Sins Prisoners of the Sky is a Japanese animated movie based on Nakaba Suzuki’s series titled The Seven Deadly Sins Manga. Set in the time when humans and non-humans co-existed, the movie tells the tale of strong & terrible Knights of the Kingdom of Liones known as the Seven Deadly Sins. While the kingdom is celebrating peace after an almost annihilating attack by a Demon Clan, leader of the Sins reaches Sky Castle while searching for a rare ingredient. There, he finds another demon clan planning to attack the castle to resurrect an evil captured 3000 years ago. The movie visualizes how the sins & castle forces defeat the demons.